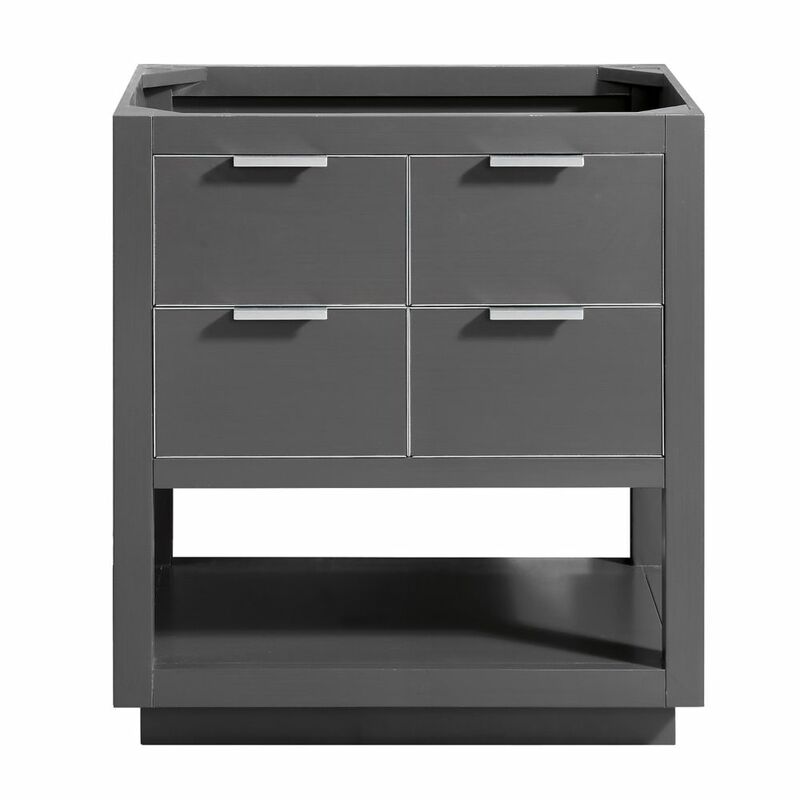 The Allie 30 inch vanity brings to you good looks and generous storage. An uncomplicated design scheme gains luster from the sophisticated Twilight Gray finish with brushed silver trim and hardware. A solid birch wood frame, plywood drawer boxes, dovetail joints, a convenient toe kick, and soft-close glides and hinges testify to the quality of construction. A large open shelf provides ample storage. Complete the look with matching mirror, mirror cabinet, and linen tower. Allie is all you need to make your bathroom amazing. The eye-catching crisp white finish of this Bosconi single vanity with be a perfect match for your contemporary interior. This design features a smart arrangement of drawers above the lower rack which provides extra surface space and easy access to your most needed accessories. The White Carrara Marble top adds interest and a strong, easy to clean surface. The coordinating mirror completes the desired effect in your personal space. Enrich your bathroom ambience with this upscale 30 inch W vanity paired perfectly with the 31 inch Lily White engineered stone top. With an understated Grey finish and a clean, sleek profile, this modern piece has an understated elegance that will impress homeowners and guests alike. Two cabinet doors with soft-stop bumpers open up a bevy of storage options for linens and bath essentials, setting the tone for a tidy powder room. The sturdiness and craftsmanship of this vanity cabinet will make you think it is custom-built, while small details like leg levelers instill confidence for perfectly stable setups. Gaze through the Foremost Ashburn collection for complementary Grey items like wall cabinets and mirrors for a complete bathroom makeover. This Naples 30 inch vanity is paired beautifully with a 31 inch Lily White engineered stone vanity top and attached rectangular under-mount vitreous china bowl. This 30 inch vanity provides an unexpectedly vast storage space, behind 1 beautiful door and 3 full-extension, dovetail drawers. Perfect for stacks of towels and a wide array of bath items you want nearby. Constructed with natural poplar wood, this sturdy cabinet is treated with an Antique Walnut finish for an elegant look. Allie 30 inch Vanity Only in Twilight Gray w/ Silver Trim The Allie 30 inch vanity brings to you good looks and generous storage. An uncomplicated design scheme gains luster from the sophisticated Twilight Gray finish with brushed silver trim and hardware. A solid birch wood frame, plywood drawer boxes, dovetail joints, a convenient toe kick, and soft-close glides and hinges testify to the quality of construction. A large open shelf provides ample storage. Complete the look with matching mirror, mirror cabinet, and linen tower. Allie is all you need to make your bathroom amazing.